Are we all being taken for a gigantic troll? And does it even matter if the Holocaust is being invoked? The first rule of public relations is to stop digging holes for yourself if you're in one. But Anthony Scaramucci, the fast-talking New Yorker with no political experience who lasted less than a dozen days as White House communications director, has a problem with Holocaust Talk on his new social media venture. The Scaramucci Post's Twitter account asked Friday, in a poll, how many Jews were living in Germany before the Holocaust. That poll came days after the account asked, "How many Jews were killed in the Holocaust?" 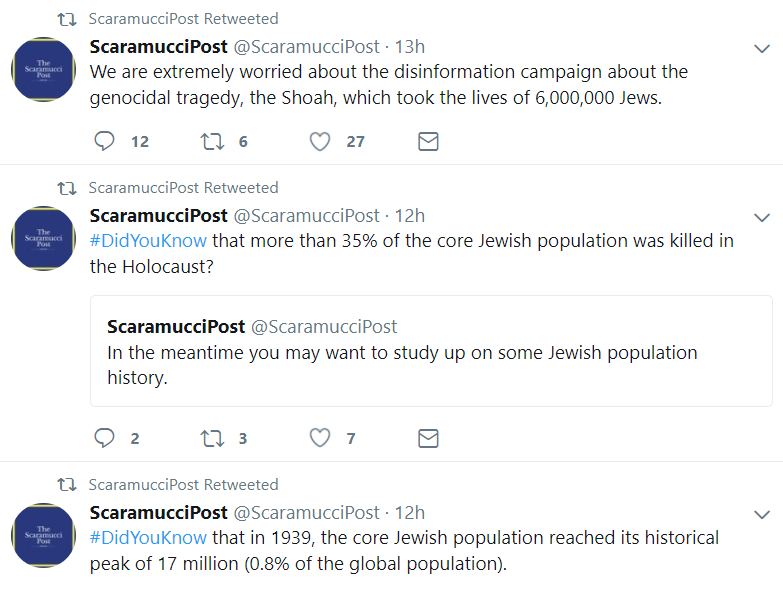 The account, which is managed by Scaramucci's partner, Lance Laifer, began by asking Twitter users, "Please do not judge our followers" — a reference to the fact that 20 percent of the Holocaust poll respondents had indicated that "less than one million" Jews had been killed by Nazis. He continued, trying to express that the poll was meant to be a means of discussing how significant the Holocaust was in terms of wiping out the Jewish population and how it was journalists who were to blame, not his clumsy tweeting, for why many Twitter users felt offended. "We are putting the poll back up because if it helps educate even just one person it will have been a worthwhile endeavor for us," he subsequently wrote. "No matter what the hit to our personal reputations..."
On Tuesday morning, after outrage to the poll spread, the Twitter handle had the initial poll erased. Scaramucci, a veteran Wall Streeter apologized for the poll, saying it was "an effort to promote Holocaust education and awareness" that had been posted without his knowledge as he was traveling out of the country. "I have publicly criticized the white supremacy movement and understand the Holocaust was one of the most abhorrent moments in world history," Scaramucci's statement continued. He also claimed that he had "put systems in place" to prevent future offensive content from being posted. While the poll was removed from Post Twitter account, an earlier message simply asking for "Thoughts?" about a Halloween costume patterned after Holocaust victim Anne Frank still remains public as of this writing. Nevertheless, the Scaramucci Post has strayed from its original message. The man known as "The Mooch" posted a video last month calling the site "The center lane in a two-lane highway." "The Scaramucci Post is going to be about what is right and wrong in the society right now," Scaramucci said in the introductory video. The irony speaks for itself.